Usually I like a stand up guy. Who doesn't? But I don't need one delivering my TV news, thank you very much. Blitzer, on CNN, seems to have started this trend that's beginning to creep into other news programs---that is, the reporting of news stories standing up, the camera showing him head to toe. There's a reason why we call the TV news people talking heads, after all. The only people I care to see standing up and walking around on the set are the weather folks, because they have big maps to show us and satellite images and they're more like class instructors to me---and those types are forever standing. But the news anchors need to take a seat. There's just something nerve wracking, to me, about having my top stories and breaking news delivered by someone standing. It's not natural. I'm not a fan of football played under the lights, as a rule. And it has nothing to do with the Lions being shunned by "Monday Night Football" every year. I know it's done for the almighty TV dollar, but night college football games especially rankle me---especially those played on days other than Saturday. College football games have been popping up all over the dial on Tuesdays, Wednesdays, Thursdays. That's not college football---that's just competitive "ER". But there is some night football that tickles my fancy. As the parent of a marching band member, one of the duties is to attend the home football games on Friday nights. There are far more daunting tasks. The landscape of politics is like Michigan weather---wait five minutes and it just might change. With that in mind, it would appear to be folly to try to ascertain what might happen in the presidential election of 2012---the upcoming mid-term elections notwithstanding. President Obama will be halfway through his term this January, believe it or not. He might also be halfway through his ONLY term. I want to believe in the Obama Administration; I voted for him, after all. My thought at the time of the 2008 election was that Obama was the right president at the right time---just like Reagan was probably right in 1980, Kennedy was right in 1960, and Eisenhower was probably right in the 1950s. But you can only be the right president at the right time if you're re-elected. Otherwise, you're just another one-hit wonder. Kennedy would likely have been re-elected in 1964; that's why I make an exception in his case. You look at the photo now, knowing what you know, and you can swear that Bethany Storro is smirking at you. Before, you might have said her expression---upturned mouth peeking through a curtain of acid-corroded skin---was that of a relieved, grateful woman who was just happy to be alive. The photo of which I speak is that of the 28-year-old Storro, who is, for the moment, the most famous hoaxster in Canada and the U.S.
She's the clearly disturbed girl from Vancouver who falsely reported that she'd been the victim of an apparently random attack in which acid was thrown in her face by a black woman. Storro was snapped, sitting in her hospital bed, the effects of the acid evident on her forehead, nose, cheeks, and chin. But not in her eyes, and not on her mouth. That makes sense now, of course---because Bethany Storro splashed herself with acid. So why would she splash her eyes and mouth? Somewhere, way upstairs, Forrest Pitcher will be smiling on October 9. Mr. Pitcher was my grandfather and he passed away on April 30, 2005 at the age of 96. Just six months prior to his passing, he had to endure the heartache of his adored Yankee Air Museum in Willow Run being ravaged by fire. The date was October 9, 2004, and the museum's hangar caught on fire, destroying eight aircraft and thousands of artifacts, along with tools. While most of the museum's collection survived, the fire essentially put an end to the tours and day-to-day operations. That's where my grandfather comes in. Forrest Pitcher, well into his 90s, conducted guided tours of the museum. I took my family on one such jaunt not long before the fire, and what a treat it was---not only to see the museum's unbelievable collection of air and military history, but to be guided by my grandfather and our daughter's great-grandfather. Don't the Livonia police have better things to do than enforce the law? Yeah, I wrote that. But only because that's what people seem to be saying. Livonia was recently tagged as the city with the worst "speed traps" in the State of Michigan. It's not exactly clear how this designation was arrived at, but with its announcement last week, there was some scuttlebutt, as you can imagine. The lead-foots contend that this surely means that motorists are being ticketed with glee by overzealous Livonia police officers, who should be doing things like "going after the REAL criminals." Livonia's police chief, of course, shrugs it off. "That (designation) doesn't bother me a bit," said chief Robert Stevenson. "We don't have speed traps. We just enforce the law." If the end of summer is getting you down---Labor Day weekend reminds us that fall is just around the corner---and you feel like you need a pick me up, I'm going to recommend a movie. But check with your doctor first, to make sure that laughing convulsively won't do you any harm. 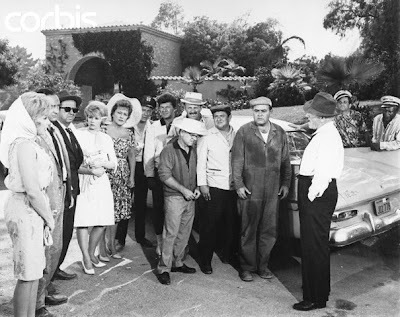 Then go out and rent "It's a Mad, Mad, Mad, Mad World." Or anything with Peter Sellers in it, if your local DVD store doesn't carry IAMMMMW. The reason you should grab a copy of IAMMMMW is simple, just like what Jackie Gleason told "60 Minutes" when asked why "The Honeymooners" is still popular. "Because it's funny," The Great One said. Many of you have probably seen "World," which I have, numerous times. You might be leaning back right now and saying, "Oh yeaaaaah.....that WAS funny!" Only a laugh riot---one of the funniest movies ever made. If you want a dog for protection, get a German Shepherd. Or a doberman. Or a rottweiler. Owning a pit bull is like walking around with a cocked gun that has a hair trigger. The aforementioned dogs in the opening sentence provide security without attacking out of the blue (for the most part). The pit bull clearly has some issues. They come in waves, these pit bull attacks. And when a wave comes, it's of the tidal variety. We're on the crest of one now. Pit bulls are running amok in Metro Detroit these days. Yesterday, a four-month old baby's scalp was bloodied. The other day, a family's five-month old puppy was mauled to death and its teenaged owner was badly injured by a pit bull gone mad. Those are just two of the recent pit bull incidents reported over the past several weeks.